Oh yeah, and supposedly they’re quite loud. If that sounds like a good time to you (it certainly does to me), then have a listen to their first single, “$600,” which bemoans the rising cost of living (among other things). We don’t typically like to compare bands to other bands, so I’ll just say this: those of you who are at all wistful about the loss of the Henry Clay Peeps will have your hearts sufficiently warmed. That is all. The band’s first single, “Personality Voices,” will coincidentally be the first release from brand new label Chain Letter, owned by Heywood and his wife Heather. If you preorder the Fakers 7″ now, you’ll get two bonus songs digitally. The single is available digitally or as a limited edition vinyl 7″ with artwork by Jessica Tosoc. The music was recorded and mixed by S. Foye. 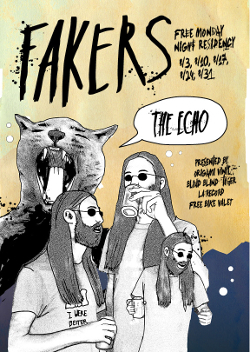 If you’re lucky enough to be in the L.A. area for the Fakers’ August residency every Monday night at the Echo, you can pick up your pre-order there. Otherwise, they’ll be happy to send it to you, and you can then listen to it while you cry pathetically over your geographical misfortune. Their first show will also be featuring Vs Colour, Afternoons (! ), Barrows and DJ Chris Ziegler (L.A. Record). Expect an all-star supporting line-up as well. There’s a rumor that the August 31 show will include The Pretty Flowers, Happy Hollows and Western Lows. That’ll teach me for living on the East Coast. 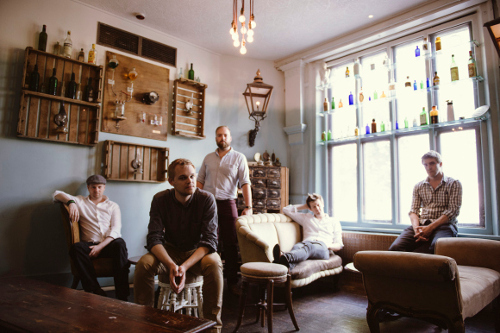 Only a band like London-based quintet Feldspar can make a jealous and murderous crime of passion sound romantic. In fact, on much of their recently released EP, We’re Still Together (on Fierce Panda/Fandango), the subject matter revolves around bitterness and despair, with only the wistful hope of salvation. But oh, those harmonies! And those heavenly soaring melodies! Their five lyrical songs of loss and lament, released through 2014 and 2015, have been gathered here together for your listening pleasure and mournful contemplation. For those in the UK, Feldspar will be performing at the Wickham Festival on August 6. Whether it’s a failed relationship or a failed society, remorse and dismay have never been so elegant. 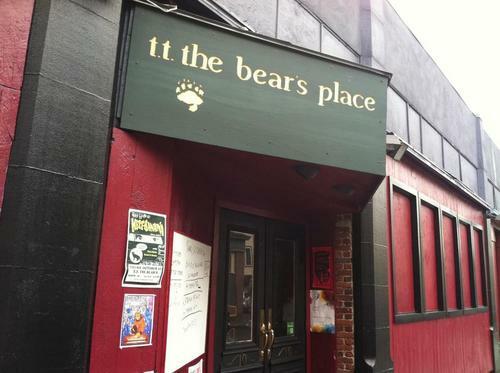 Who says that Boston bands have “attitude”? Uh yeah, they do. 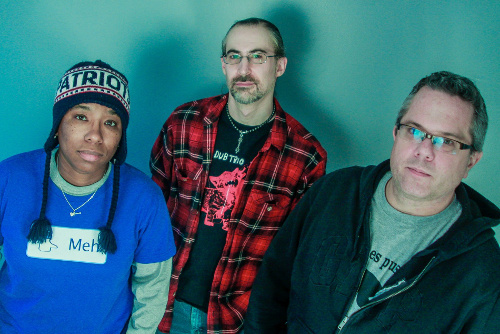 But in the case of Beantown locals Six Times Seven, they also have a powerful and feisty sound that borrows from ’70s metal bands and the heavier end of ’90s alternative rock. Suffice it to say that these guys (and gal) have plenty of bark and bite. 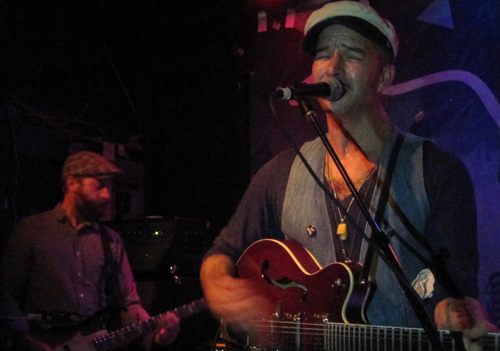 Six Times Seven is fiercely fronted by vocalist and guitarist Stevie Caldwell. Ron Levine is on bass and Dave Zimmerman plays drums. That’s it. And for this muscular power trio, that’s plenty. Their debut EP in 2013 was the wryly titled A Lesbian, a Jew, and a Dave, which demonstrates a healthy dose of wit as admirable as their music. A bad attitude is perfectly fine; a lack of sarcastic humor would be unforgivable for a Boston band. On their latest EP, Ish, they continue their hard, edgy and slightly menacing vibe. It may seem unlikely that a Hole fan and a Hawkwind aficionado would join together to form a rock band, but that’s exactly what happened when Caldwell met Levine in 2011, and the unlikely merging of their particular musical sensibilities, punk fury and musical sophistication, gave rise to something quite interesting. They have a pair of shows on the horizon — August 23 at Venu Nightclub in Boston and September 19 at PA’s Lounge in Somerville. Until then, enjoy the delicious angst of “The Devil Rise” from their debut, while the band works on new music for their first full-length release. Stay tuned. Something thrashy for you on this fine day. It’s a new single from Frantic Sunday, though it’s likely that this Swedish band’s exhuberance runs pretty steady through the entire week. “We’re the Future” portends very good things for their sophomore album. 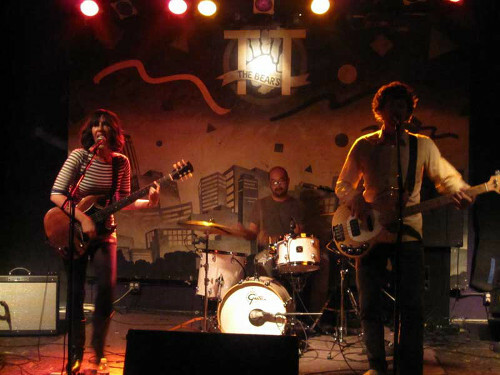 Frantic Sunday came into being in 2008 and have performed all over Europe, the U.S. and Canada, including many festivals. 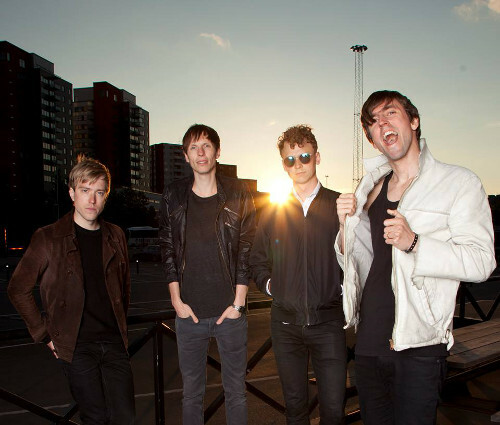 The released their debut album just last year, but have had several singles and a self-released EP from 2009-2011. Their debut ended up in the #3 spot on the Swedish iTunes chart when it was released. They have a new album coming out in September, produced by Patrik Frisk, and are planning a European tour this autumn with a U.S. tour slated for Spring 2016. Their sound, at least judging from this first single, has a more mature sound and a harder edge which I believe will serve the band well. It’s the strangest feeling, now that I know you are gone. That you have been gone for 27 years. All this time I had kept alive a romantic notion, a vision of you in foreign lands — a poet, a pirate, a painter, a writer, a thespian, a sculptor of Raku chess pieces as I remembered from the mid-1970s when I knew you. In the gauzy passage of time and without the inconvenience of truth, I entertained fanciful thoughts. Were you, I wondered, a cloistered writer in a small Vermont village, or a devout monk in an Indian ashram? The truth had far less romance than my imaginings. I learnt you were gone from a fellow student of our progressive and now defunct high school. You were involved for some years in various performing arts groups, which I knew about. Though in the final years of your life, you weren’t a world-renowned concert promoter or an explorer uncovering ancient mysteries in some remote cave in Fiji, but instead were building model train layouts and custom dollhouses at a hobby shop in Connecticut. I don’t know why this disappointed me. I was even sadder to discover that we lived in the same town for a few years, though galaxies away. None of that matters now, of course. 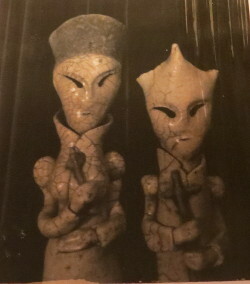 My parents have two of your Raku pieces, the queen and bishop, in their living room. One was broken by an old boyfriend’s brother, who in a drunken moment, accidentally kicked it, knocking off the perfectly curved top of the bishop, so gently and perfectly formed, full of such grace. You introduced me and my wide-eyed and clueless peers to Samuel Beckett, Yukio Mishima, William Burroughs, Jean Genet. Had us lie down once, in our woodland mountaintop classroom, and close our eyes while you led us through a guided meditation and then read us a story. I remember a cottage in the woods, a stone hearth and the smell of bacon cooking, as real to the senses as if I were there in the room. Burroughs gave me nightmares, but I was so enamored with Beckett that I designed my own course (as we were allowed to do in that nutty place), and I read and read and read. I still have those books, yellowed with age and at times with entire pages of text underlined. What was I thinking? I was clearly driven, obviously inspired, worked up to a delirious frenzy, but over what? I no longer remember. The anxiety, the paranoia, is still there, and ever more deeply ingrained and finely chiseled with each passing year. You cast me and my inner demons in a 2-person play, you and I. It was an honor, a privilege. You saw me as a writer, an actress, one of your shining stars, even though I never saw myself that way. I don’t recall the play, but we were to perform it in front of the entire school, parents, friends — until the administration deemed it too risque and pulled it from the evening’s program. I was devastated. Once on campus, you presented a formal Japanese tea ceremony for your fellow teachers, students and parents. It was elegant, otherworldly. You brought us all into that sacred space and I was entranced by the idea of an altered state of reality, without the need of hallucinogenic substances. Just tea. And tea bowls. A scoop, a whisk, a piece of cloth. Ritualized sharing and reverence. My parents drove me to your friend’s house, somewhere in the wilds of Northern Connecticut. The astrologer. He read my chart and made predictions. I have an old cassette tape somewhere. It was my first foray into self-examination, self-discovery, the esoteric arts, that would soon become a life-long passion. You were there for that, too. Flash forward nearly 40 years — FORTY! I’m in my monthly spiritualist salon, in the parlor of our hostess’s old Victorian home, and she’s giving our close-knit group personalized mediumship readings, as is our custom. She comes to me and brings through someone named Robert. Bob. I don’t know any Bob in spirit. None of my deceased relatives have that name, nor any living ones either. I’m perplexed, as she’s usually spot on. Only now does it slowly dawn on me. The message? That I’m weighted down with a terrible burden, and I need to drop it and stop worrying, continue to develop my gifts. Something tells me that this new song from Coastwest Unrest’s fourth release, Black Desert Sweet Mojave (due out July 28 on Reclaim Records) won’t be getting a whole lot of commercial airplay. Which is a shame, really, as “All the F*ck You’s” is a beautifully melodic and poetic little beast of a number. Coastwest Unrest has been around since 2009 with some personnel changes over the years, but centers around bothers Josh (drums) and Noah (vocals, guitar) Dickie. 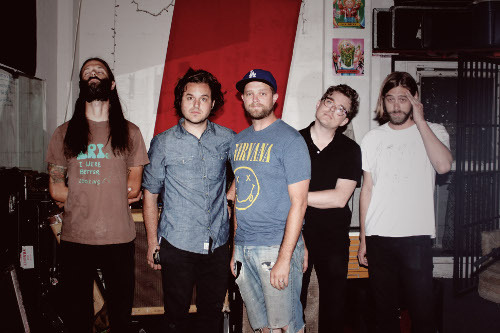 Their prior releases are Songs from the Desert (2009), Old Weird America (2010) and High Times on Lowly Streets (2013). They have a pretty irresistible vibe going, whether it’s something in a rootsy Americana vein or more “high desert” and owing quite a bit to their Las Vegas home. What ties it all together are intriguing lyrics and Noah’s low, relaxed and warm vocal style a la Matt Berninger. For those on the West Coast, they have some shows coming up — Seattle on 7/21, Eugene on 7/22, Boise on 7/24 and Elko, Nevada on 7/25. Hey, don’t be down on this bright, sunny summer day (or cold winter day, if you happen to live in New Zealand) — You Are Beautiful! 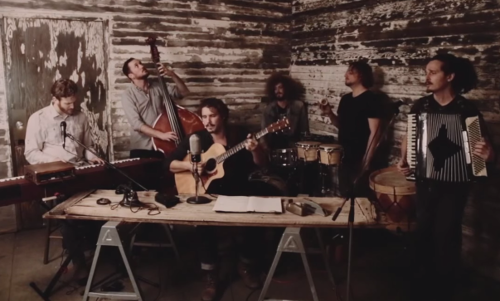 No, this isn’t a New Age affirmation; it’s the latest single from L.A. indie folk outfit The Herbert Bail Orchestra. They’re not exactly an orchestra of the classical variety, but the Americana-with-horns sound on this song is lush, full and celebratory. It’s a joyous and upbeat track that will definitely raise your spirits. Download it free from Soundcloud. 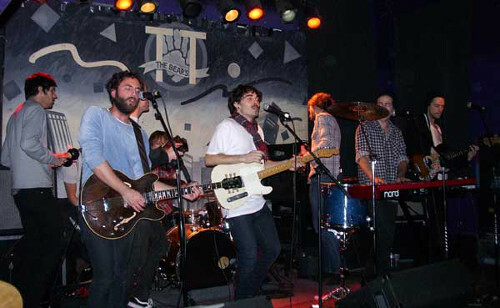 The Herbert Bail Orchestra’s debut EP was in 2011, which was followed up in 2013 with a full-length album The Future’s In The Past. At different times, you’ll catch glimpses of DeVotchKa, Edward Sharpe and The Magnetic Zeros and Lord Huron, with lusty vocals, strings, horns, accordion, tinkling piano, life-affirming choral uprisings and driving percussion. Fans of Gogol Bordello, Of Monsters and Men and performers of that ilk should also take note of these guys. They’re the musical equivalent of The Wild West. 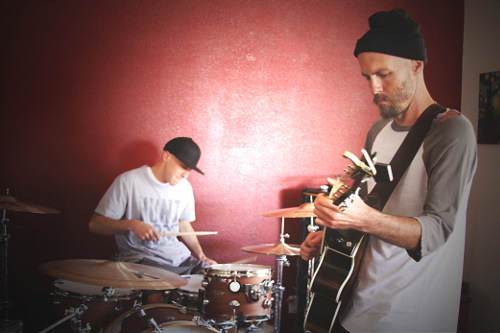 Last year, they collaborated with award-winning director Björn Rühmann on a music video triology inspired by three songs from their album. Part I: The Nature of Things, explores the journey of a man and his dog on their final road. In the video for “Hold On” from Los Angeles-based We Are The West, it feels as though you’re peeking through a keyhole into someone else’s daydream. It was filmed in Malibu in collaboration with Clifford Cruz, and is inspired by Stanley Donen’s 1974 film, “The Little Prince.” In that story, a young prince from a distant asteroid falls to earth and lands in the desert, where a stranded pilot finds him. It’s a philosophical tale illustrated in watercolors that speaks of the strangeness of the adult world. The video has a similarly eerie and otherworldly feel, as the song seems to convey its own strangeness in a life examined, softly and honestly told, with a distinct sense of sadness and disillusionment. It ends with the plea to “hold on,” which hangs unanswered in the air. We Are The West features Brett Hool (vocals, guitar) and John Kibler (bass, vocals), with friends Elizabeth Goodfellow (percussion, voice) and Marië Abe (accodion) joining them on “Hold On.” It includes a cover of “The Thin Red Line,” written by songwriter Michael Bush, which features Dina Maccabee on violin. The title track has Jesse Olsen Bay on pump organ and Elizabeth (Beth) on cymbals. 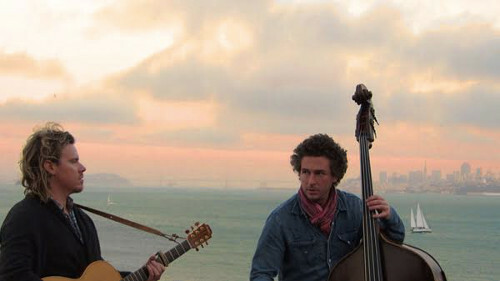 This experimental folk duo (and friends) have become known in L.A. for their stirring and intimate storytelling and the unusual venues they perform in, which have included shipping containers, abandoned convents and an underground parking garage in Santa Monica, where they’ve held a monthly concert series with other Los Angeles luminaries such as Aaron Embry and Lord Huron. We Are The West (whom we first wrote about in 2013) are playing a rare performance on the East Coast at a Lysten Boston Presents show at The Middle East (corner) on Monday, July 13, along with Honeysuckle and Heather Woods. Considering their history, this will be a rare opportunity to see this underground ensemble above ground. On “Morning Is Leaving,” the first single from Sara Forslund’s debut album Water Became Wild, her voice is barely a whisper, yet she immediately commands your attention. Mystical and intimate, she’s minimally accompanied by a simple piano melody. Other songs on the album, just released on VOLKOREN, feature cello and trumpet in addition to piano. Water Became Wild was produced by Forslund and fellow Swedish musician David Ahlen, mixed by John Wood (Nick Drake, Pink Floyd, Richard Thompson, Fairport Convention, Cat Stevens), and is available from VOLKOREN (CD – Digipack in Europe) and from Time Released Sound (CD – limited edition – U.S.). Forslund’s melancholy imagery and spiritual introspection is perhaps inspired by her father, a priest in the small Swedish village of Borgvattnet, who offered to exorcise the ghosts from the village’s haunted vicarage. Now based in Stockholm, Forslund began in the folk band Birch and Meadow, where one can hear the seeds of her unique style being sown. 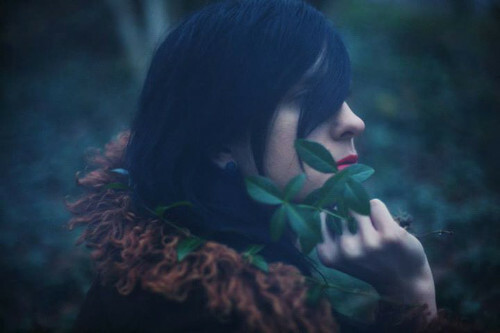 They released their debut album Butterflies and Graves, but a concert by singer-songwriter Gareth Dickson (and subsequent introduction to the music of Nick Drake) inspired her to strike out on her own. She has performed in Sweden, the U.K., Australia and New Zealand. If you live in Sweden, the release party for Water Became Wild on July 5. See the Facebook event for more information.